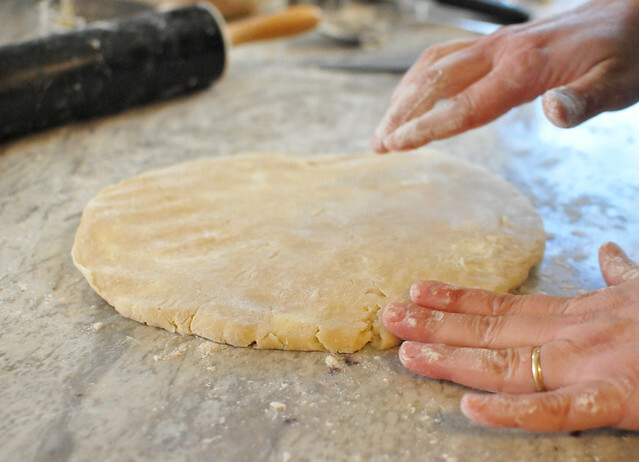 A couple of weeks ago, we hosted our first ever in-house cooking class, How to Make Pastry Dough with Kremena Stefanova. 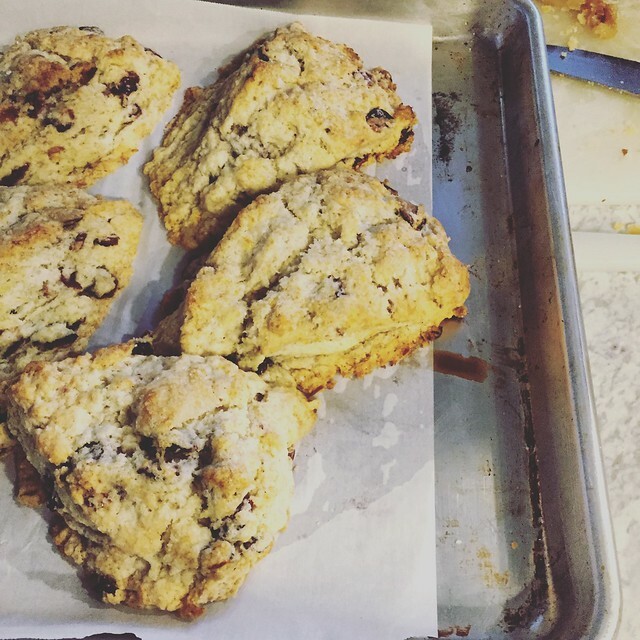 Many of you know Kremena from around Del Ray — during the week you may see her at the Caboose Cafe and on the weekend at Four Mile Run Farmers Market (when in season). 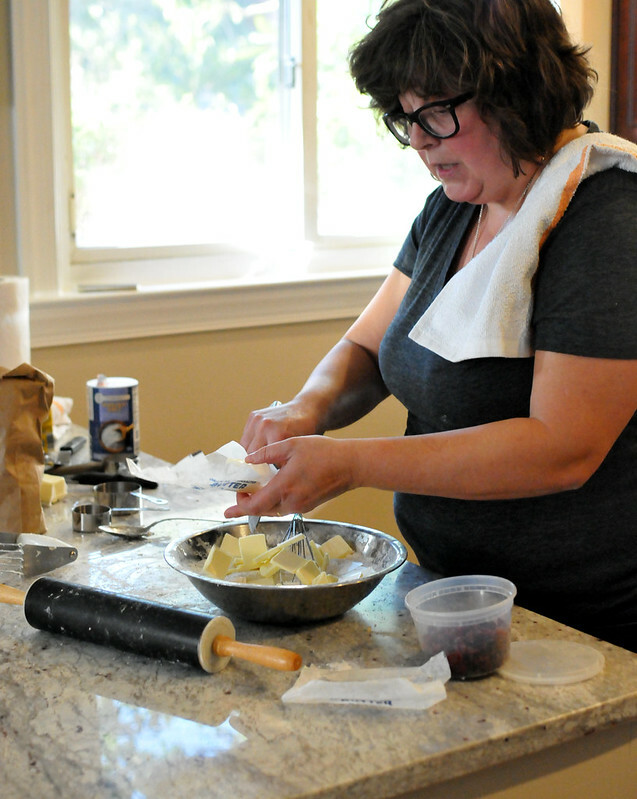 But for the class, she came to my house and demonstrated how to make dough for sweet and savory dishes for me and eight other attendees. The class was just as we had hoped — informative, fun and very tasty! 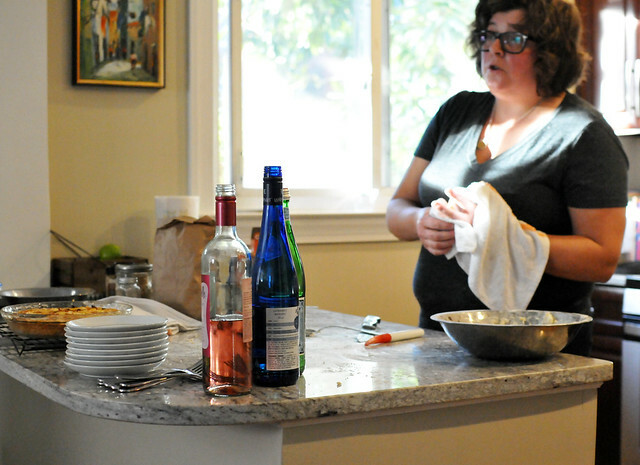 Everyone got to sample all the dishes Kremena made while sipping wine. 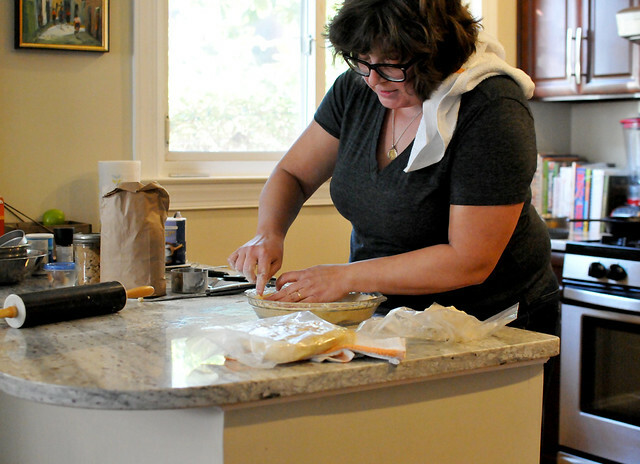 First, Kremena walked us through a standard quiche dough: 2 cups flour, 2 sticks cold butter, 5-6 T cold water, 1/2 t salt. Kremena usually mixes this by hand or with a pastry cutter, but today she used my Kitchenaid mixer. You can also use a food processor, but she says mixing by hand works just as well. 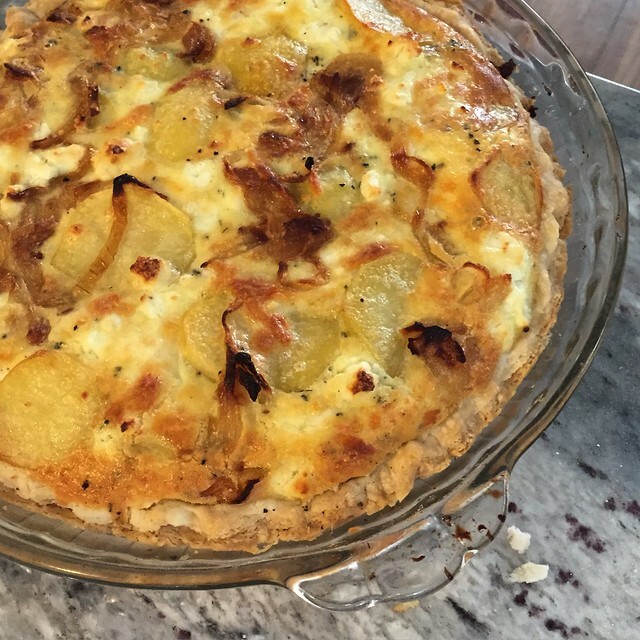 For the quiche filling, she layered disks of pre-cooked potato, a mix of feta and mozzarella cheese, sauteed onions, eggs mixed with cream and the herb savory. 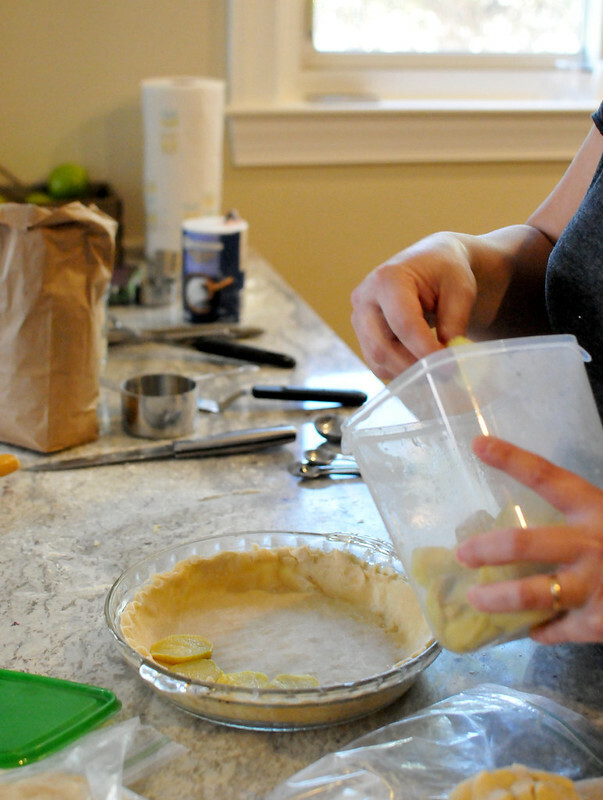 Tip: Use a glass quiche pan to avoid a soggy dough. 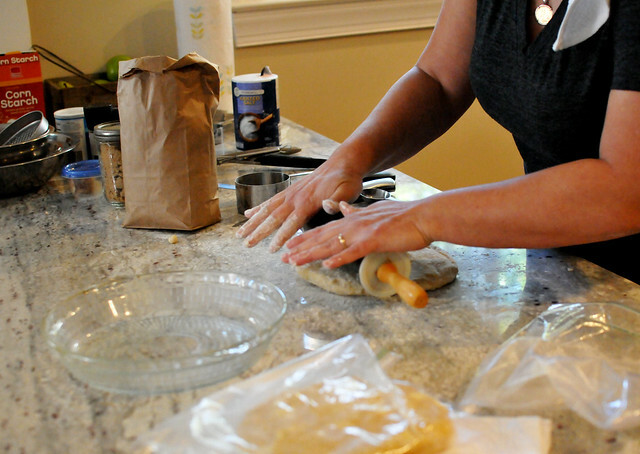 While the quiche baked, she demonstrated a similar dough that can be used for sweet dishes. 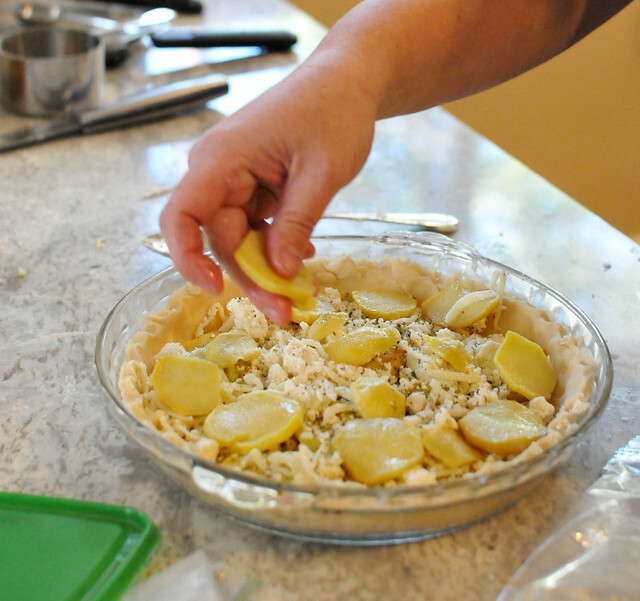 The ingredients are about the same as for quiche: 2 cups flour, 2 sticks of butter, 6-7 T water, 1/2 t salt. The big difference, however, is that you should mix the ingredients by hand so you don’t have evenly distributed chunks of butter. 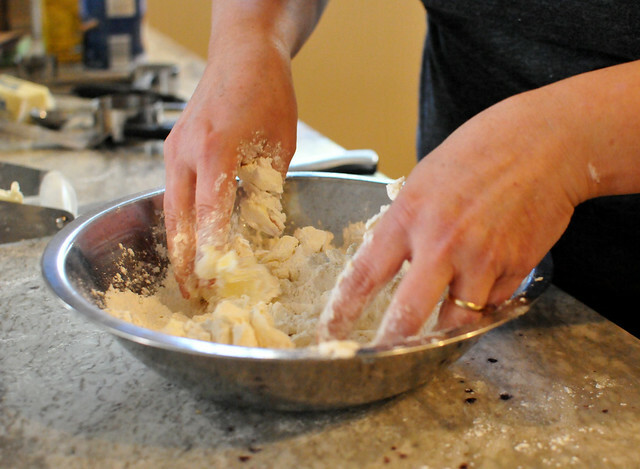 The chunks of butter are what will make your pastry flaky and delicious. 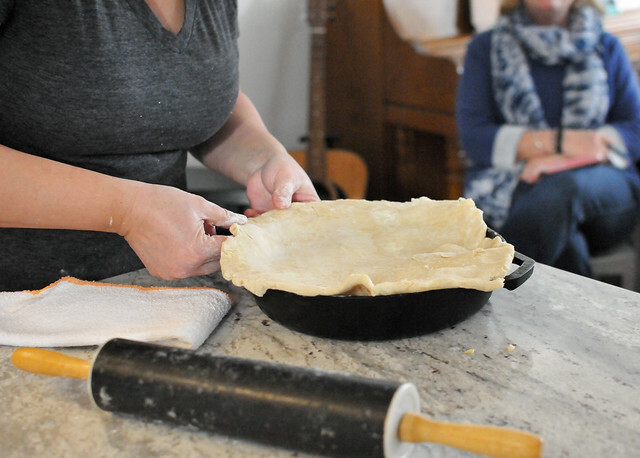 Like the quiche dough, you should also store the dough in the fridge overnight before using, so again, when she assembled her upside-down apple galette, she used a dough she had made the night before. 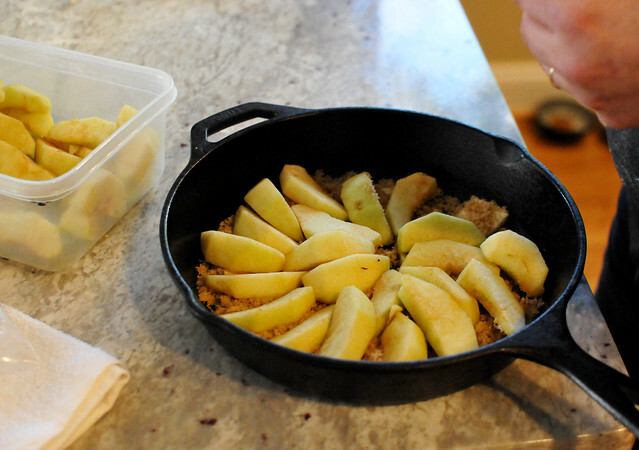 For the galette filling, Kremena layered chunks of butter, brown sugar, cinnamon and apples in a cast iron pan. 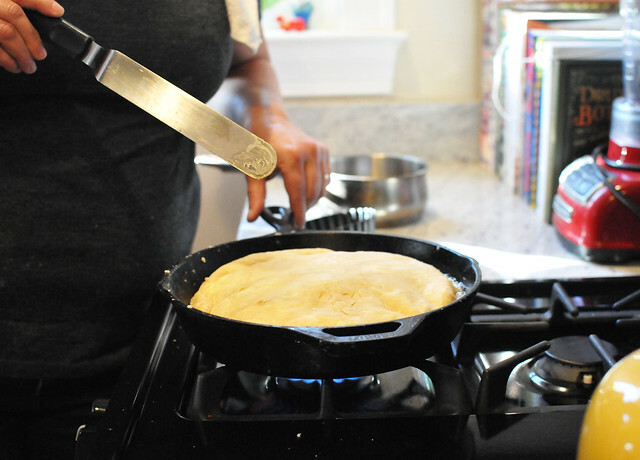 Then, she covered the filling with the dough, tucking the edges into the pan. 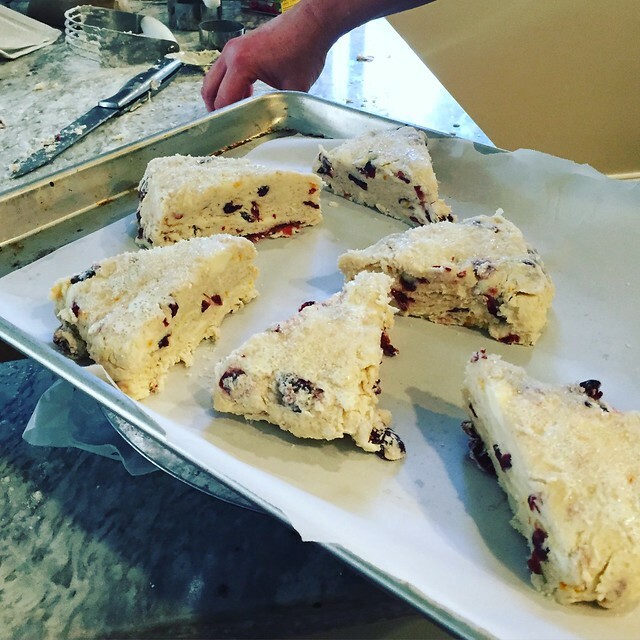 Finally, with a few minutes left in the class, Kremena demonstrated how to make scones. With her hands, she mixed: 3 cups flour, 5 T sugar, 1 T and 1 t baking powder, 2 sticks cold butter, 1 1/4 heavy cream, 1 cup dried cranberries (soaked in water in advance and drained), 1/2 t salt and the zest of one orange. 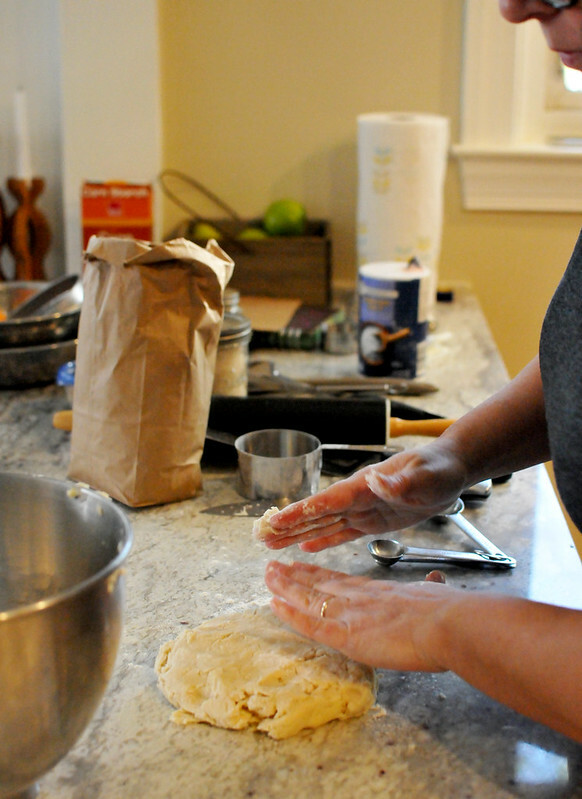 Scone dough doesn’t need to rest in the fridge, so she formed the dough into a flat circle (sorry, no picture! ), brushed the top with cream, sprinkled with coarse sugar, and cut it into 8 wedges. The wedges baked in a 385 degree oven for 20 minutes. And when everything was done, we sampled! 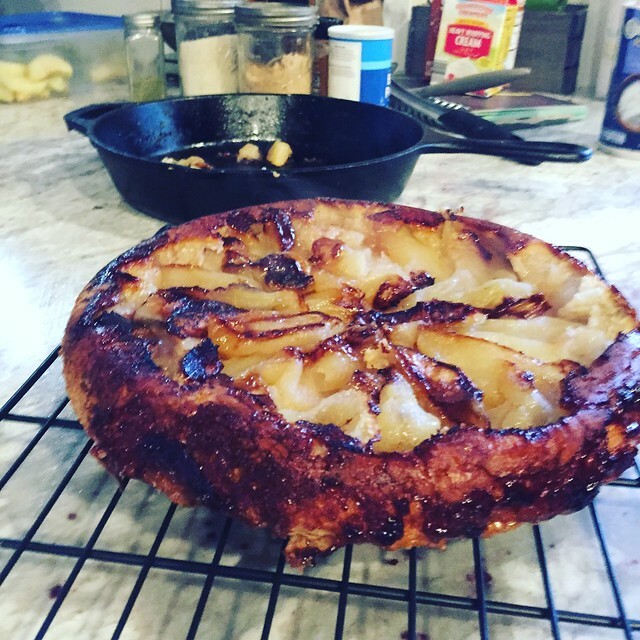 Here’s some Instagram pics of the quiche, upside-down apple galette (inverted) and the scones.